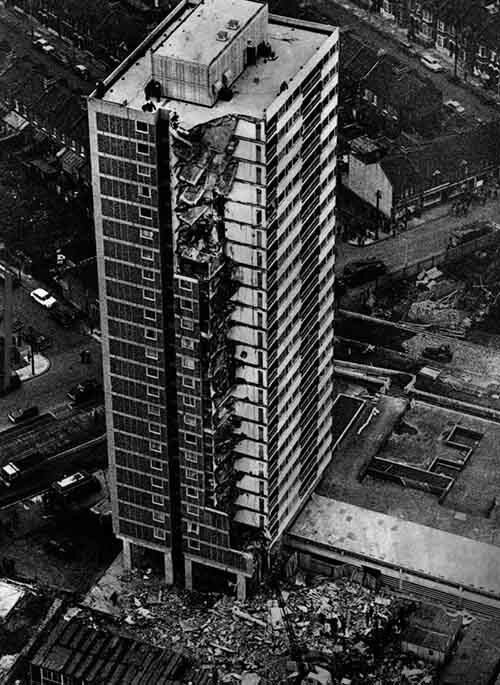 On this Day, May the 16th 1968, 4 people were killed in a gas explosion at a 22-storey tower block in Newham, East London, changing the face of the construction and building services industry forever. Ronan point was part of a new wave of cheap, affordable tower block housing, built for the inhabitants of the West Ham region of London. Finished on March 11th 1968, it was only partially occupied at the time of the explosion a few months later, hence the low death toll. Resident Ivy Hodge, who lived in a corner flat on the 18th floor of the building, lit a match to light the stove. The spark ignited a gas explosion which blew Hodge across the room (she would survive) and caused a progressive collapse down to the ground floor. The blast blew out inner walls and consequently, outer wall panels, which weakened the structure beyond tolerance level. The lower floors simply could not handle the weight of the collapsed upper floors. A public enquiry followed, to identify the flaws in design and construction. The explosion was caused by a badly fitted pipe fitting on the supply line to the cooker. However the explosion was found to be a small one (evident from the fact that Ivy Hodge survived with relatively minor injuries). Although the building was designed in compliance with Building Regulations of the time, it was clear these regulations left a lot to be desired and the public’s confidence was shaken. Even high winds, fire or even a window on one side of the building being left open, could have caused the building to collapse (even without the explosion). “The building shall be constructed so that in the event of an accident the building will not suffer collapse to an extent disproportionate to the cause”. The Ronan Point disaster didn’t just change the regulations in the UK either, ripples were felt across the world. In the USA, building regulations were amended accordingly as a direct result of the collapse as this was the first of it’s kind anywhere in the world at the time. Ronan Point received a high profile presence in the media for several years. The public enquiry and subsequent assorted prosecutions rekindled media interest at regular intervals as the building was just one of hundreds of new tower blocks built to similar specifications at the time. Ronan Point seriously shook public confidence in gas and the gas industry. As a result virtually no high rise blocks were built with gas in them, high rises became fully electric. In 1970, British Gas formed a voluntary body for gas installers (CORGI) and in 1972 the first ever Gas Safety (Installation and Use) Regulations came in to force. Gas Safe Register is now the gas registration body but it all stems from the events of 1968. ACS, regular training and reassessment is crucial to make sure the public retains faith in the gas industry and it’s professionals, ensuring we never experience another Ronan point again.